One week half- and full-day programs for youth ages 7-16 are designed to develop new media literacy, computational and creative thinking, adaptability and problem solving, and coding proficiency. 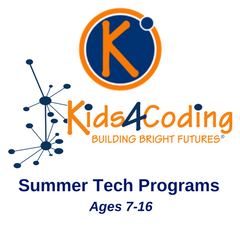 Kids 4 Coding’s interactive modules are new each summer, created in collaboration with tech industry professionals and educators. Sessions are supervised by certified teachers and taught by experienced instructors who are passionate about technology. This summer, Boston area students can learn to code games, robots, drones, musical compositions and even build their own laptops (to keep!) through summer tech programs offered by Atlanta-based Kids 4 Coding. VOTED One of Atlanta's Top 10 Most Innovative Young Tech Startups (Microsoft Azure 2015) and also featured in TechRepublic & Entrepreneur. The technology startup, with multiple locations including Atlanta and Nashville, is now accepting registrations for campus-based sessions at Newbury College in Brookline and Lesley University in Cambridge.